- High durability and high resistance to limb twisting. - Very practical crowned shelf, and you get an arrow rest in the package if you prefer the slightly less-traditional solution. 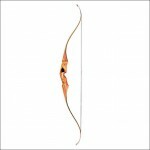 - Excellent transfer of energy from the limbs to your arrow. Very accurate even when compared to much more expensive bows. 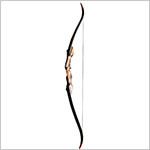 The first bow I ever purchased was the Korean Samick Sage, which cost around $140 at the time. After spending a few months playing around with it and when hitting small targets from a 20 yards distance was no longer an issue, I decided to take things to another level to see what do the better recurves have to offer. Plus, I was really excited about going deer hunting – something I had never done before back then. I had a budget of around $300, and I began searching. Out of the 30 or so replies that were given, a whopping 20-ish recommended the PSE Blackhawk. Back then I hadn’t even heard of PSE, so I decided to do some digging around. I learned that PSE was likely the biggest archery equipment manufacturer in the United States, and that they have been in business since 1970. This obviously wasn’t enough to make up my mind, so I started reading reviews of the bow, and was hard-pressed to find any negative feedback. I decided that I would go for it, with the plan of selling the Blackhawk on eBay if it didn’t suit my needs. So how did it all end up? I’ll tell you about it at the end of this review. For now though, let us take a look at what beast we’re dealing with here. The PSE Blackhawk does not come with a stringer unfortunately, so you’ll either need to buy one (they go for a few bucks), or just use the accompanying instructions to manually string your bow, which is an important skill to learn anyway. However I do recommend buying a recurve stringer if you don’t have one already, as it will serve you for many years and will allow you to enjoy your bow for longer. The package does include one cool element though. An arrow rest. That’s definitely good news for someone who doesn’t like shooting off the shelf, as they can start shooting their new bow immediately and out of the box. How about the string? 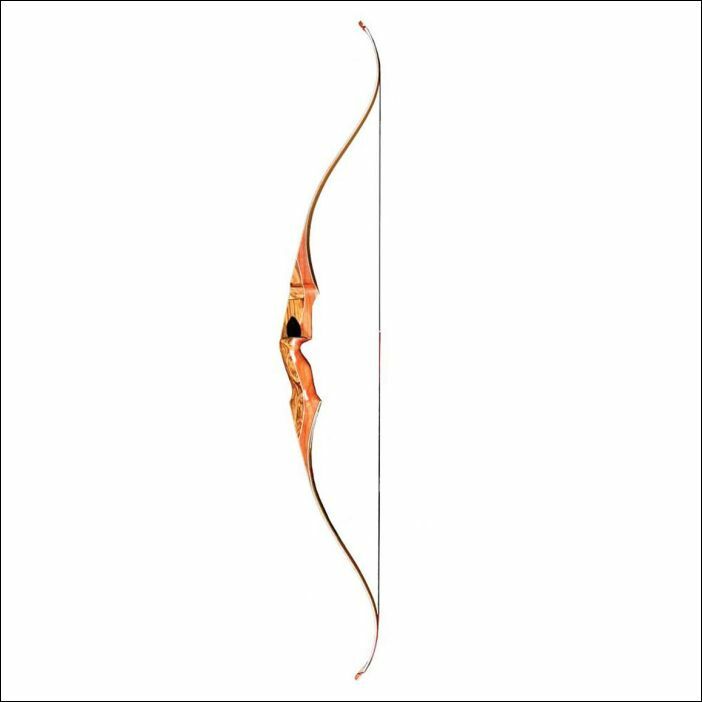 Because of its durability and stretch, Dacron is commonly used on beginners’ equipment, wooden bows, and older bows. The relatively high stretch causes less shock to the bow, which is an important consideration for wooden-handled recurves. Dacron strings are easy to maintain and can last several years. As I have already mentioned in another part of my site, it looks like something taken directly out from one of the Lord of The Rings movies. Since the PSE Blackhawk is a one-piece, the limbs cannot be detached from the riser. 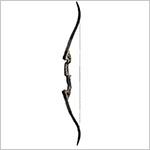 This bow is 60″ long, so please make sure that transportation and storage won’t be an issue for you. The riser is beautifully shaped and the grip is comfortable to hold, and comes with a crowned (“close to the hand”) shelf. I find the Blackhawk to be very good for some good-old instinctive shooting – no extra equipment, no cams, no $300 sights… that’s how I like it. So, what about the materials? If you’re a complete beginner, a 3 pound bow might seem somewhat heavy to you at first, though you should get used to it really quickly. If uncertain however, and if you have never held a recurve before and have no point of reference, then I recommend starting with a different, slightly lighter bow, such as the Martin Jaguar (Review here). My personal experience is a positive one. Because of the one-piece construction, the transfer of energy through the limbs->string->arrow channel is very efficient, and the result is a smooth draw as well as a vibration-free shot. I’ve found arrow groups to be quite tight in the 10-30 yard distance, though some people do report a tendency for a slightly elevated arrow trajectory when compared to the performance of other recurves. The bow will not limit you in any way and the only restrictions to how far of a target you can shoot will be how well you can aim. Is The PSE Blackhawk Good For Hunting? This is where I feel the Blackhawk shines the most. It’s very resilient to temperature changes, and quiet enough so as not to scare your prey away in an unexpected fashion. I’ve gotten 4 deer with it in my first two years of hunting, so I guess I can’t be anything but happy. In fact, I think I still have some of the meat in the fridge (though I likely won’t be eating that, but I somehow can’t get myself to throw it away). Please make sure to read our guide on choosing draw weight to understand how much of it you actually need to hunt various types of game. So what’s the final verdict? Well, I can tell you that not only I never sold the bow on eBay after shooting it, but I also still shoot it to this very day despite having a few far more expensive recurves in my collection. If you’re still not entirely sure though, I think you might benefit from first checking out my other recurve bow reviews – they should definitely help you make a decision. 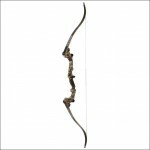 Check out Today's Amazon.com price on the PSE Blackhawk. This bow is apparently on a large backorder. I was told the Greatree Deerslayer is the same bow. Thoughts, or suggestions on picking a similar bow? 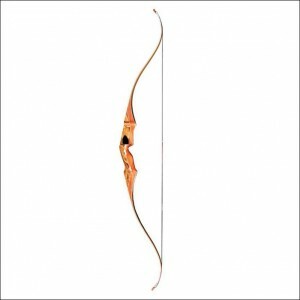 Could you tell me what you are looking for in a bow? I’ll try to suggest something then. Sorry, hadn’t seen that you responded! (THANK YOU!) I’m pretty much a beginner that used to do archery years ago as a kid, and I’m looking to get back into it. I am partial to one piece recurves, and a 35# is light enough for me to draw fairly well but heavy enough for me to improve on. We have a tight budget, so this bow, with its positive reviews, looked perfect for me. Thank you again, and I look forward to hearing your thoughts! Solid one-pieces are pretty hard to find in the Blackhawk’s price range unfortunately. What is your maximum budget if I may ask? We were hoping to be under $300 out the door. I was able to find the Blackhawk through the Sportsman’s Guide. Ordered it last night! Very excited! Glad to hear it Christine 🙂 What poundage did you get? Ordered the 35#. Will say it was a hard decision when it came down to it between some of the Samick one-piece bows and the Blackhawk. Will let you know my thoughts once it comes in! It arrived today, and I love it! Will have to work to get my strength up, but it’s beautiful and shoots so smoothly! Thanks for this article for all the advice! I stumbled on this post when searching for my first bow. I’m a newbie, as I just picked up the sport a few months ago. This was incredibly helpful. After an exhaustive search online (huge back-order), I finally found it at the Sportsman’s Guide as well. I’ll let you know what I think when it comes in next week! I bought a pse black hawk as a beginner to archery with a 50 lbs. draw. I wanted to be able to hunt big game with no issues. However I find that no matter my form I always have string slap at my wrist. I have shot half a dozen recurves since my purchase without a similar problem. One thing I have noticed is that the distance between my nocking point and arrow rest is considerably smaller than the other bows I’ve used. Could this be the source of my problem? The gap distance is 3.5 inches. Yep, that’s the problem. The brace height (the distance between the string and the deepest part of the bow riser) for the PSE Blackhawk should be between 7 to 7.5 inches. Twist the bow string to shorten it. in other words, increase the gap from 3.5 inches to 7 or so. Hope this helps. I’m guessing you found the answer to this by now being a couple months old, but your assumption is correct. When stringing the bow you should twist the string to make it more tight. Keep doing this until the string is roughly 7″ to 8″ from the part of the grip where the crook between the thumb and forefinger rest, around 7.5″ being ideal. I recently picked up a Blackhawk on sale at Cabela’s for $199 and I’m extremely proud of the purchase — I wouldn’t have known this either being new to “real” archery, but the sales associate was outstanding. Also, I just noticed the 3.5″ part.. yeah that’s WAY too small, especially if you’re talking about between the string and where your thumb/forefinger come together. Even before the associate twisted mine it was a good 6″+. That almost makes me wonder if they shipped the wrong string with yours, but I’m a novice myself. I’d certainly try the twisting method and if that still doesn’t give you enough of a gap I’d say they sent the wrong string.